A blog for Sean Gaffney to review manga, anime, cartoons, and occasionally to ramble on about diverse and sundry notions. But yeah, mostly manga reviews. By Hiroyuki Asada. Released in Japan by Wani Books, serialized in the anthology Robot. Released in North America digitally by Denpa Books. Translated by Andrew Castle. The book is titled Pez, and I’m not sure if it’s meant to reflect what most people from my generation think of when we hear the word, which is to say the candy you got out of the package with the cartoon character head. It’s meant to suggest a light, sweet, ephemeral sort of think. And now we have the Pez manga, which is not all that light, somewhat bittersweet, and… well, OK, it does feel pretty ephemeral, as it seems to end right about where most manga would begin. But that’s fine, because this feels more like a doujinshi, the sort of high-concept original work you’d get from an artist who’s filled with creativity but also does work for Weekly shonen Jump to pay the bills a little better. It’s only 72 pages or so, but they’re all full color, which also helps to distinguish this. As for the plot? Well, it’s a post-apocalyptic slice-of-life, which is actually pretty popular these days, so it seems a good time for it to come out collected here. 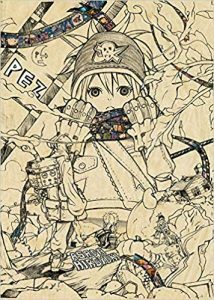 Most of the short volume is Pez and Decosuke walking the Earth, finding bombed-out shelters and discussing things. There’s a sweet bit where they find an old pizzeria whose chef is caught under rubble – they can’t free them from their inevitable death, but they can get instructions on how to make a delicious pizza. Sometimes it’s ridiculous, as with Pez’s imagining what sweets are like. And sometimes it’s inspirational, as the ending involves Pez and Decosuke following the “lights” in the sky and seeing where they lead so they can find out how the world got this way. They will find out, maybe, but we won’t – the book wraps up there. That said, as a one-shot it feels well worth the purchase, being made entirely of mood, and with some Wonderful sketch-like art that you’d normally only see in the likes of Ikki and similar magazines – or in the pages of the Robot anthology. It feels like a boutique manga, the sort you’d leave on your coffee table to impress the guests.